types are attracted to specific disciplines professing that their form of yoga is the only ‘true’ yoga while others are more than happy to mix and match believing that ‘yoga is yoga no matter what’. Everyone is entitled to their opinion and fortunately there is a class out there for everyone. Children’s yoga isn’t any different. Purists state that yoga should be taught to children using only the true principles of yoga and the use of stories or games distract children out of their bodies and minds. Others teach yoga to children using proven techniques to support their learning and encourage their participation. Young children learn holistically – by visual, auditory and kinaesthetic means at the same time. Some are more visual or auditory than others but by combining the three you are encompassing all and magnifying the learning outcome. 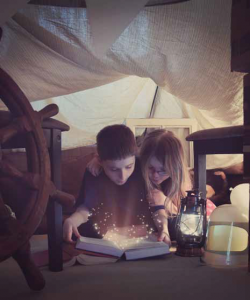 According to Dr. Margot Sunderland, an award winning author and registered child and adult psychotherapist: “Used well, stories can become a vital part of a child’s healthy, emotional digestive system”. Feelings like happy or sad are easily understood by a child but other emotions like frustration, tiredness, grief or anxiety, are harder to conceptualise. Many young children, on starting school, develop stomach aches or headaches but can’t recognise these as symptoms of anxiety from their new surroundings or life. Acting out yoga through the medium of story really comes into its own here. For example, a story being told through the expression of yoga could portray the main character as developing a tummy ache then through a chance meeting with a wise, old owl could learn that their emotions are creating this physical ache. Of course, the wise old owl can then teach the child how to release this tension through simple breathing techniques. The child therefore learns, through story, that these feelings are normal and that there are solutions. Such storylines, through repetition, become ingrained in the mind so the child’s future, automatic response to tension in the tummy, will be to perform deep diaphragmatic ‘belly’ breathing. The topics that can be addressed are limitless: making friends; bullying; being different, and so on. Of course stories have been used for years by both teachers and parents as a way of teaching children valuable life lessons – everyone knows the story of ‘The Boy who Cried Wolf’. 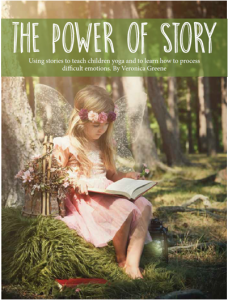 Presenting yoga through story not only captures their imagination and enthusiasm but also teaches the children about the power within themselves, physically and mentally. It provides them with a lifetime toolbox of techniques to self-calm, energise, be in the moment and accept – all traits that can help navigate life’s challenges. We all use our internal projectors when hearing or reading a story. We play it out visually in our head giving the characters shape and the landscape form. By simply recapping part of your story at the end of a children’s yoga class, while the children are in a supine position, this guided imagery then becomes a meditative process. This is a wonderful way to introduce young children to meditation and mindfulness and the beginnings of a yoga nidra practice. 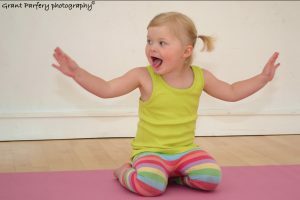 Find out more or book into our kids yoga classes here. What is Clinical Massage Therapy?